So, out of pure curiosity (I swear - I don't have any intention of buying these), I had a quick snoop on the net to see what I could find and these were the outcome. Not only did I come across leopard print variety of these shoes, but 3 other colourways from the same seller at just £9.70. Ok, so they're not as cheap as the similar £8 black studded pair in Primark, but I love the pop of colour that these shoes could easily add to an outfit. I should also add, I've made a Facebook page today for the blog, despite my general lack of enthusiasm for Facebook these days, I'd love for you to like it - I don't know what the bleedy heck I'm doing, but it's a better platform to interact with readers, so I thought I'd give it a go! Click here to have a gander! 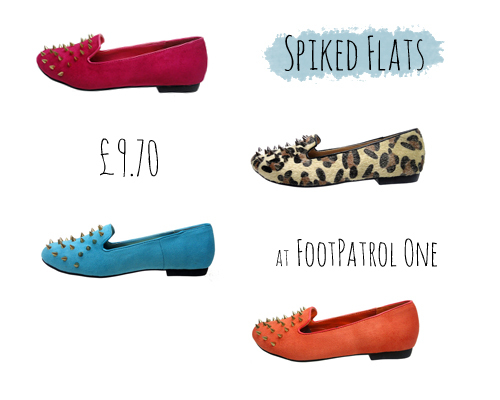 I would happily welcome all four of these beauts into my wardrobe, it's such a shame I'm too much of a shortie for flats! Ha. LOVE this post, I love a bargain, I've just 'watched' the blue pair on ebay Thankyou!! Ah brilliant :) So glad to hear this! I'll take a look :)!